The inspiration for this recipe comes from the brilliant vegetarian cookbook A Modern Way to Eat by Anna Jones. It's filled with inspiring recipes, but one with roasted feta and raw tomatoes really caught my eye. You'll love feta this way, roasted until warm in the oven. In this recipe, I serve roasted feta with lemon and herb quinoa, zucchini and seared cherry tomatoes. In a pot, combine quinoa and 2 cups water. Cover and cook 12 to 15 minutes, until the quinoa is tender and absorbs all the water. Fluff with a fork. When the quinoa has cooled a bit, mix in 1 to 2 tablespoons olive oil, the zest and juice from the lemon, fresh herbs, and salt to taste. Set aside. Place the feta on a parchment lined baking sheet and drizzle with a tablespoon of olive oil. Roast in the oven for about 25, minutes until feta is bubbling and golden around the edges. While the feta is roasting, saute the zucchini in 2 tablespoons olive oil over medium-high heat. The zucchini can be left slightly firm, or cooked until it is very soft – whichever you prefer. In a separate sauté pan (wide enough to fit the cherry tomatoes in one layer) over medium-high, heat 2 tablespoons olive oil. When the oil is hot, add the cherry tomatoes – be careful, the tomatoes will spit and splatter oil. Cook for 3 to 5 minutes, stirring occasionally, until the tomatoes are blackened in spots and are getting soft. Add garlic and cook 1 to 2 minutes more. Season lightly with salt. Spoon the quinoa onto a large serving platter. Put the warm feta in the middle. Surround with zucchini and tomatoes. 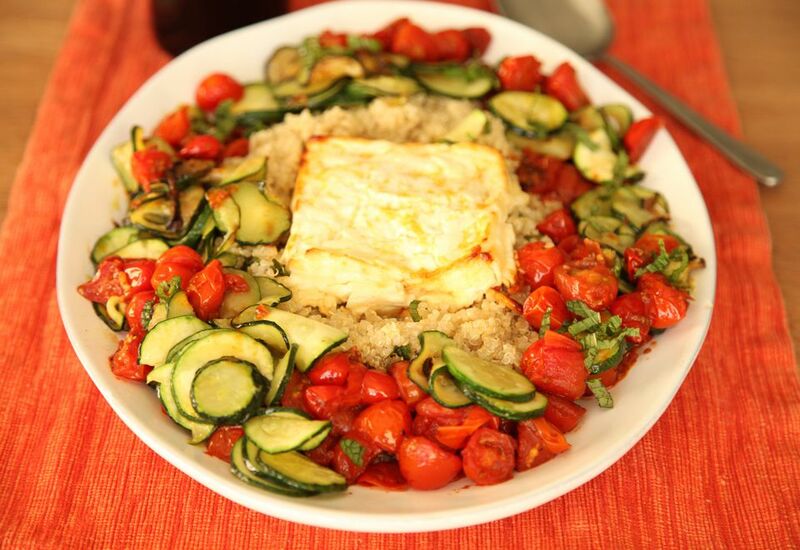 To eat, break the feta up into large chunks and crumble over the quinoa, tomatoes, and zucchini. Do I Have to Rinse Quinoa? Before cooking quinoa, it is usually recommended that you rinse it in water. This is because quinoa can have a slightly bitter flavor if not rinsed. To rinse quinoa, swish it around in a bowl of water then drain using a fine mesh strainer, or just run water over the quinoa while it's in the strainer. However, rinsing quinoa isn't as crucial as you might think. Many brands of quinoa have been polished or pre-washed to remove the bitter but harmless coating (called saponin).